We're so excited and proud that our partner Game-U was honored with the Outstanding Startup in the 2017 Biztech Awards from Columbus Business First. Focusing on teaching kids the value of STEAM learning through the development of their own games and apps, Game-U has been a constant driving force in Columbus's education scene. Multivarious has been a partner with them ever since the first GDEX (back when it was OGDE in 2013), and I (Multivarious's CEO/President Chris Volpe) is one of the Directors of Operation for the Columbus branch of the company. You can read more in the links below if you have a Columbus Business First subscription, but a quick background on Game-U. 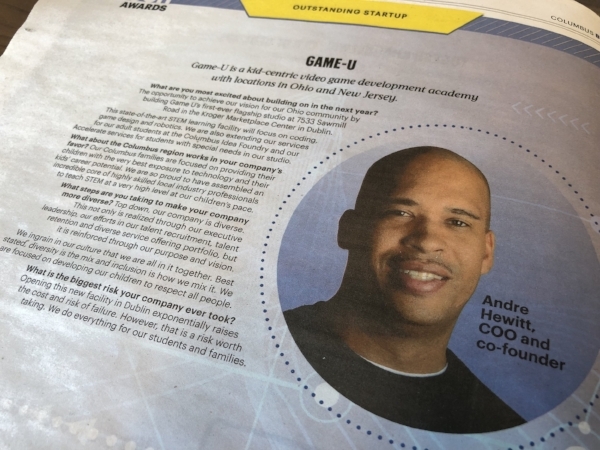 Game-U was started by Mike Kawas, a many year veteran of the video game industry, when he started to notice that he would get all this interest from kids wanting to intern or shadow with him, but that at the end of the experience he didn't have anywhere else to send them to further their education. So he created Game-U! I'm proud to be a part of such a great organization, and I look forward to a future filled with young game developers. You can read the article here if you have a Columbus Business First Subscription!